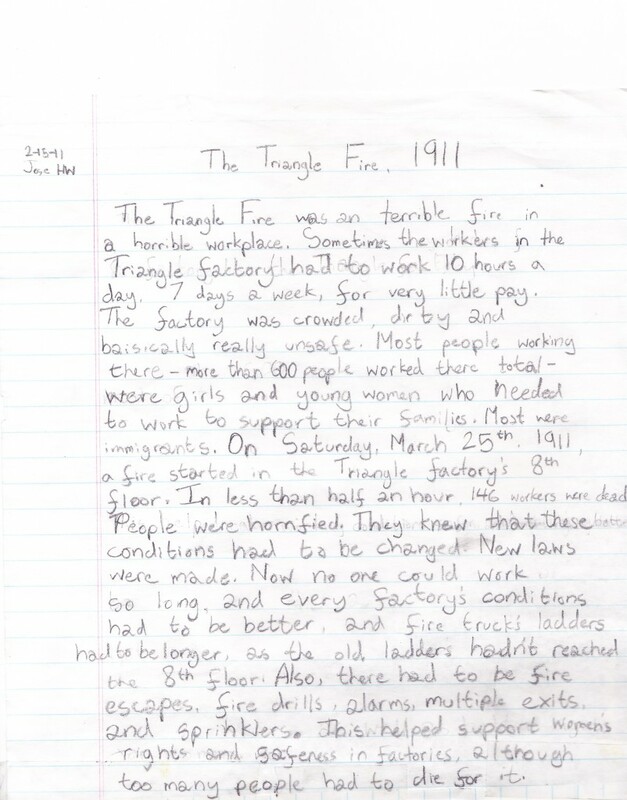 The assignment was “write about a time in history that means something to you.” Josie was shocked that none of her classmates had heard of the Triangle Factory Fire. One of the victims, Jennie Stein, age 18, lived across the street from the school. We wondered if she ever attended. How did Josie know about it? She read a terrific children’s novel called Gotcha, by Carol Matas, about immigrant garment workers, union drives and the Triangle Factory (about the strike, not the fire — I believe the fire is mentioned in an afterword by the author) when she was 6 or 7. That started her asking about women’s suffrage, so she read a batch of those too, as well as all the non-fiction for kids about the fire she could find. What kills me is that it is ALL still relevant to moral education and parenting TODAY. Chinese and Bangladeshi sweatshops? Women’s rights in Iran? Wisconsin much? Feh. Thanks. This brings up another interesting thought for me – was she scared/upset? I see that the first novel she read didn’t mention the fire, presumably for that reason. My sensitive 5yo just learned about the earthquake (we just said “a lot of people got hurt, it can’t happen here”) and seemed unfazed. It’s so hard to predict what will affect them. Our babysitter even let her watch the news last night (don’t ask!) and she did not seem upset… not that I’m letting that happen again! When do you tell kids about these kinds of things? And how? Glad your kid is coping ok.
It’s not exactly the most hard-hitting expose of the tragedy, but it really stuck with me. Great job, mama. Exposure to real life events, in an age-appropriate manner, is part of the growing-up process. I know that I don’t want my kids to shy away from reality just because it is ugly, troubling, upsetting, etc. A very good essay…and I love her stylized penmanship!! It was a Saturday. I never knew that. Thanks, Josie. Loved spotting Josie in the Times!